In this instance I will have to agree with Mr. Eliot. 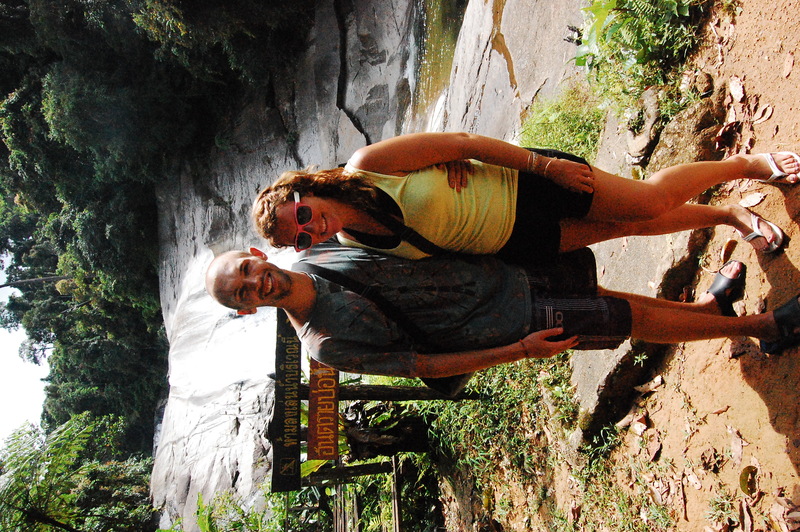 Our journey to, and through, Luang Prabang is the story worth telling. Since we arrived on the mainland in Phuket, Thailand we had decided we’d rely on trains, boats and buses as much as possible in order to save money on airfare. We further determined that taking overnight trains and buses would save on an evening’s accommodation and we wouldn’t waste anytime during the day, when we could be out and about, in transit. 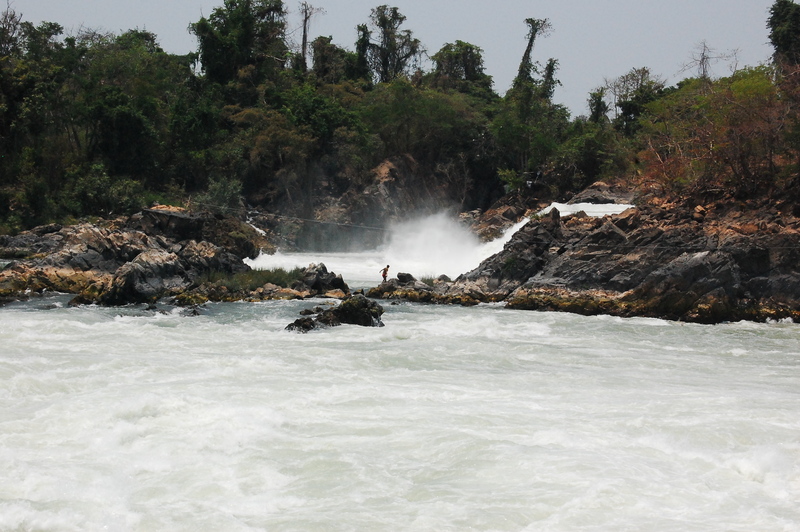 This seems logical, and in some cases it was, but in others we faced excruciating and nauseating trips, and our journey to Luang Prabang was no exception. 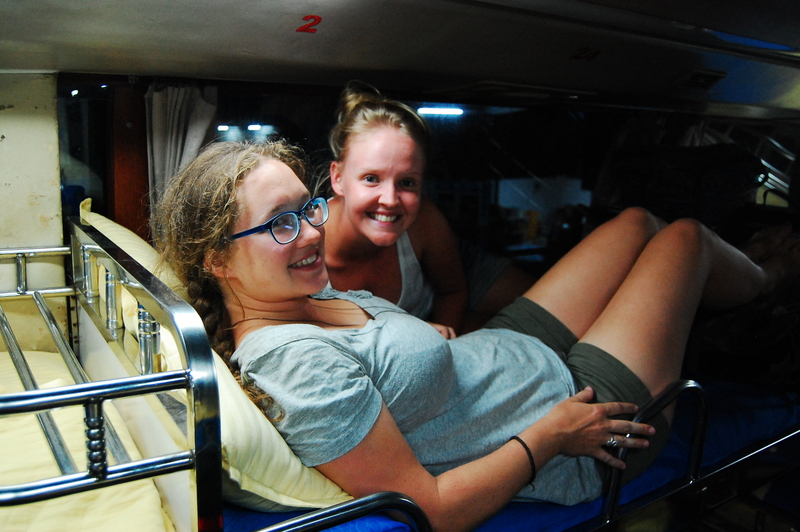 Therese and I booked an overnight bus ticket from Vang Vieng to Luang Prabang. We were set to leave at 9 p.m. so we checked out of our guesthouse in the afternoon, left our bags with the family running the business and used the remaining time to explore, send some emails and eat laap (a fresh salad with cooked chicken or fish, lime and a ton of mint) at our new favourite Laotian restaurant. At 8:45 p.m. we made our way to the pick up spot. At 11:30 p.m. we finally got picked up. Our tuk-tuk driver explained the bus had been delayed, caught in one of the treacherous pot holes that rule the roads in Laos. We were frustrated but thought nothing of it as we headed off into the night. 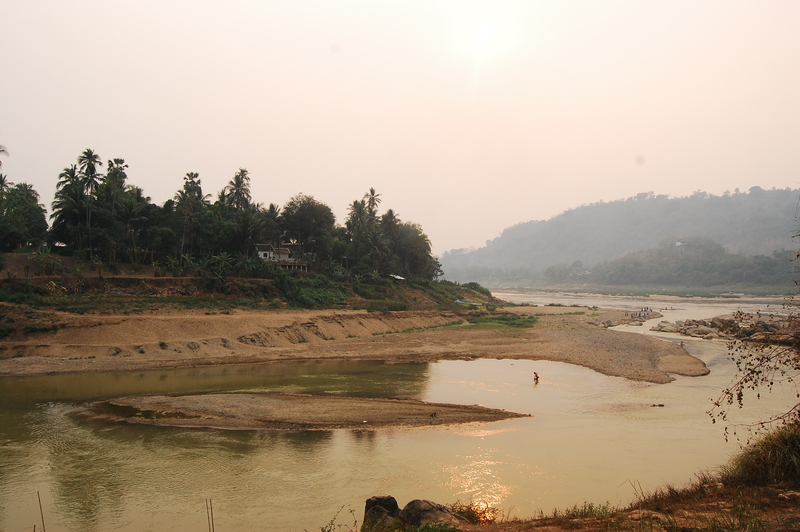 That is until I realized we were heading south, out of town when the bus station was to the north, as was Luang Prabang. We thought perhaps we had misunderstood the location of the bus station until, 30 minutes later we were still heading south in the tuk-tuk. 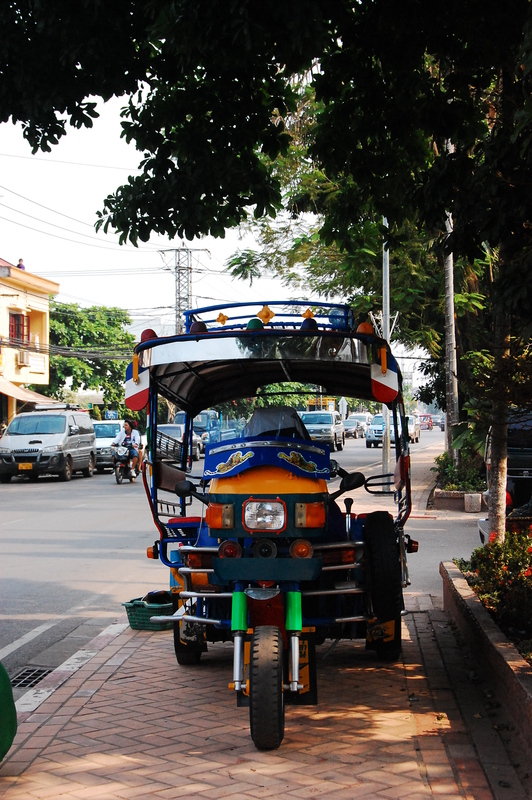 A tuk-tuk parked on the street in Laos. 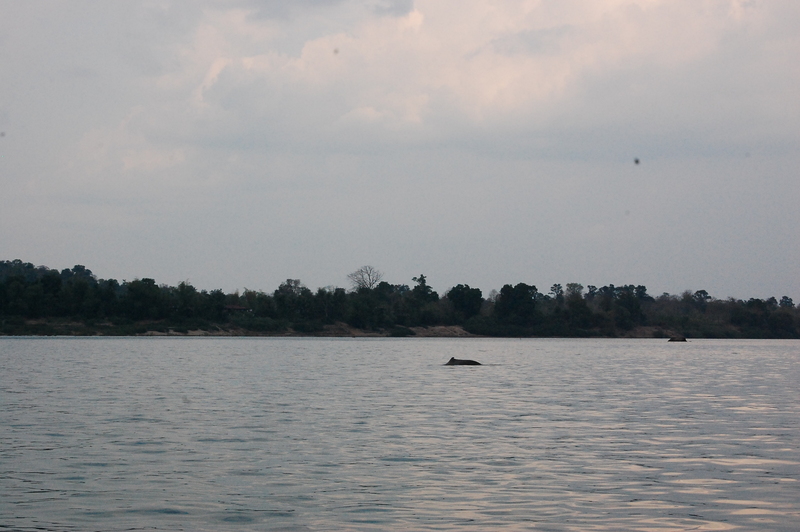 Just as I figured we were on our way back to Vientiane we came to a lurching stop on the side of the road. On either side were rice fields. It was pitch black. I was concerned. As our driver started to drag our oversize backpacks off the back of the tuk-tuk my worries were somewhat quieted as in the distance I could see the lights of a bus heading toward us. Sure enough, it pulled over to the side of the road and we were ushered on. No tickets, no explanation. Like the outdoors it was blindingly dark on the bus. With our hands guiding us we realized this bus was yet another bunk bed bus and it was full. I asked the driver if there was an open bed. “For two people,” I insisted, worried we’d be split up, set to share a single bed with one of the shadow covered strangers. Sure enough there was a space, a bed at the back of the bus. We climbed up the ladder to the top bunk only to find it was in fact a double-sized bed, already occupied with two local men. But as there are two people to each single this was technically a spot for four so we squeezed in, our heads grazing the ceiling as we sat up discussing the evenings events. 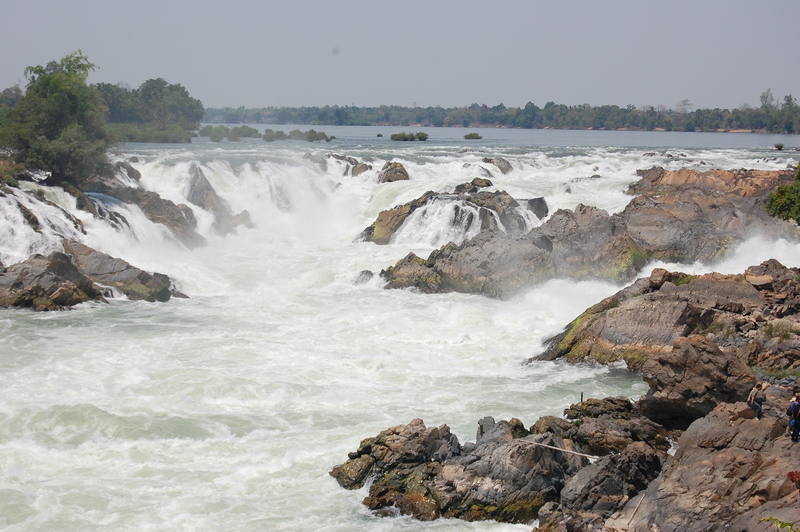 The peninsula where the Nam Song and the Mekong rivers meet. I’ve mentioned the bumpy roads in Laos. And we all know the back of the bus feels the bumps the most. So imagine riding on the top bunk of a bunk bed in the back of a bus. We were winding through the mountains at 60/km and hour being launched into the air and crashing back down for 9 hours, bumping into our neighbours and getting no sleep at all. When we finally arrived, and the sun began to pour in through the windows we finally caught a glimpse of the surroundings. This was not like the first bed bus we had ridden. This wasn’t a tourist bus. This was a bus mostly packed with locals, in disrepair and needed a serious clean and we were both covered in a rash. The journey was our story. 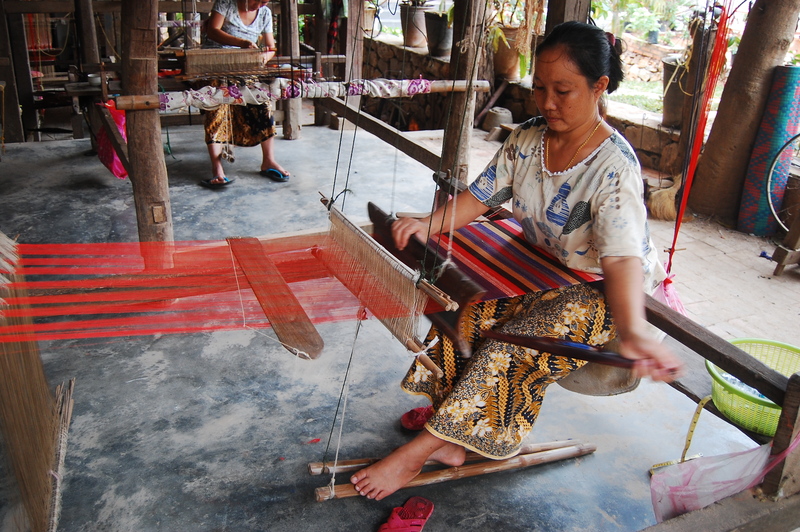 A women weaves silk in a village near Luang Prabang. Still, it was all worth it when we walked down a winding side street on the Luang Prabang peninsula, stumbled across a beautiful cottage-style guesthouse and caught our first sight of the Mekong that we had followed all the way from the Four Thousand Islands. 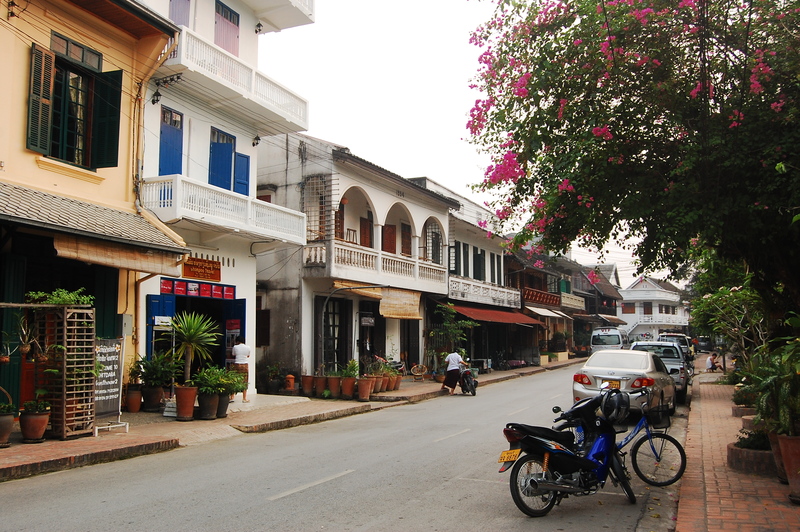 Luang Prabang, as a whole, was my favourite town of the entire trip. It had a stunning night market every evening, the peninsula boasted more temples than hotels and you could walk across the rivers, both the Mekong and the Nam Song (the peninsula is where the two meet) on hand made bamboo bridges to visit rural villages known for farming, fishing and silk weaving. 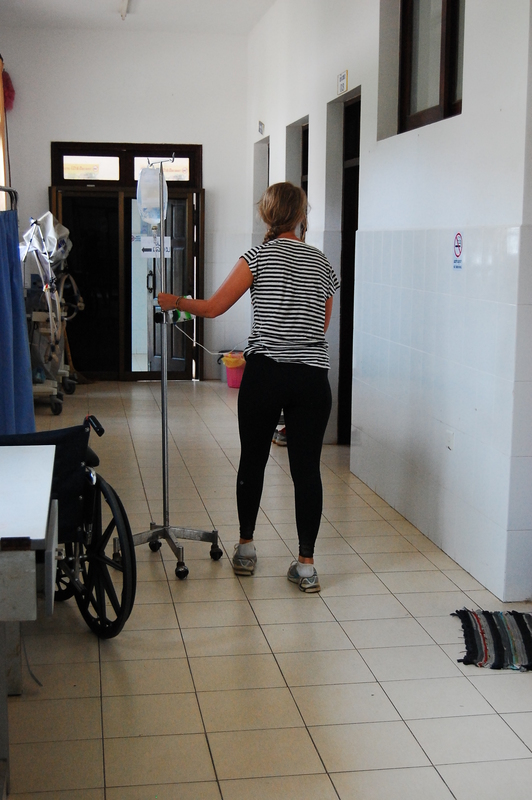 Caught wandering through the hospital looking for a washroom. 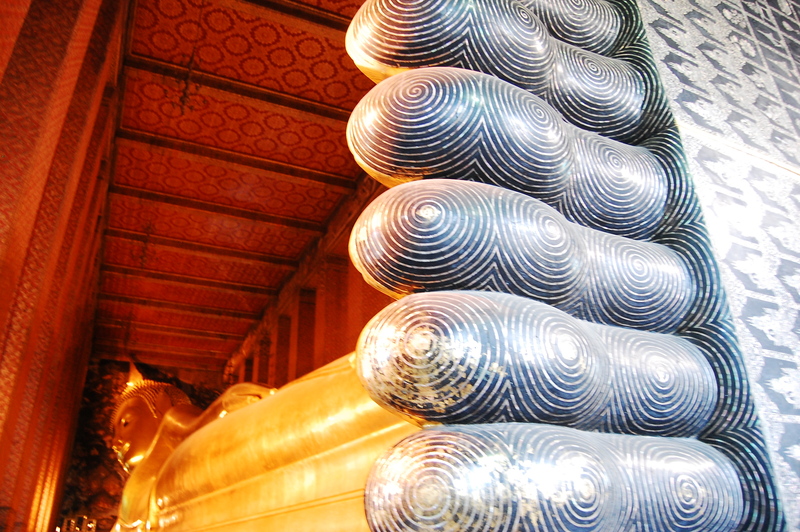 Unfortunately while we were in Luang Prabang travelers sickness caught up with me. After spending two days in bed with a fever, headache and a rash, running to the washroom every ten minutes I thought some positive thinking would help. 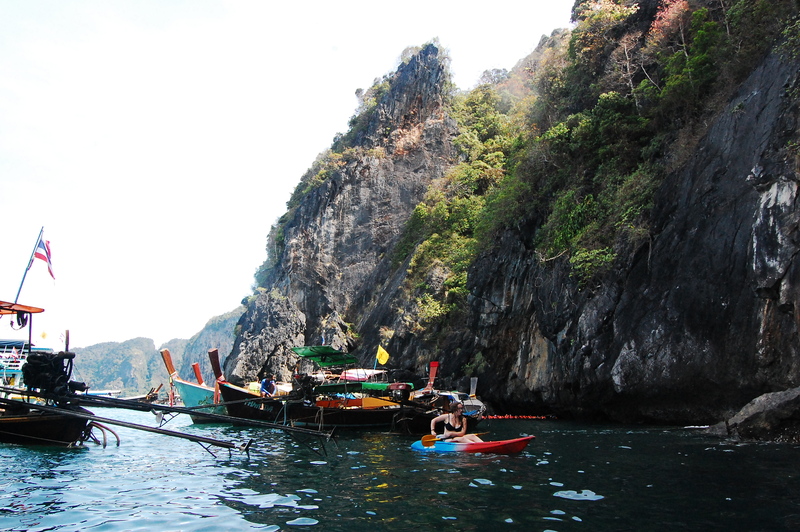 I livened up and booked a hiking/biking/kayaking tour to an elephant sanctuary for the next day and hoped for the best. But my luck had been used up and after vomiting three times on a 35km bike ride I knew I had reached my limit. I was driven to the hospital that day and spent four hours on an IV, replenishing fluid I think, although I was given a few shots and we had difficulty communicating as no one spoken English. My Laotian is limited to hello and thank-you. 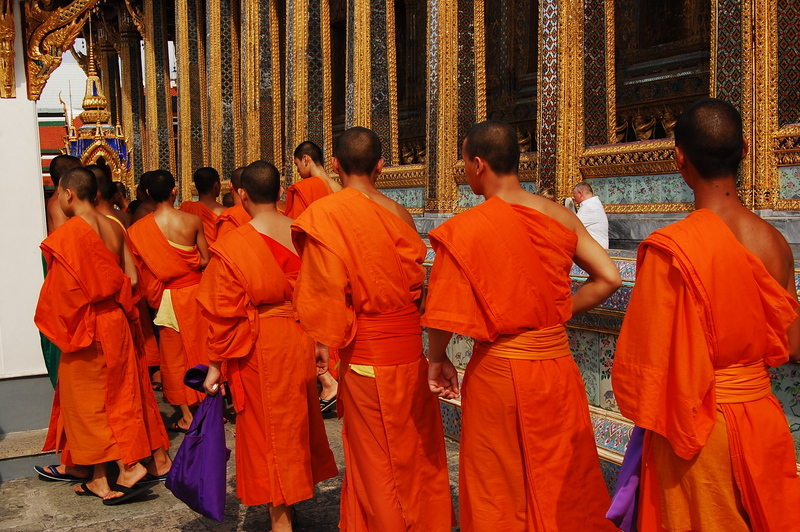 Monks collect alms, walking the streets as the sun rises. Still, Luang Prabang was a highlight, the people were kind, our accommodation was comfortable and cheap and I managed to purchase most of my gifts (a lot hand woven silk was stacked in my backpack) in the colourful town. 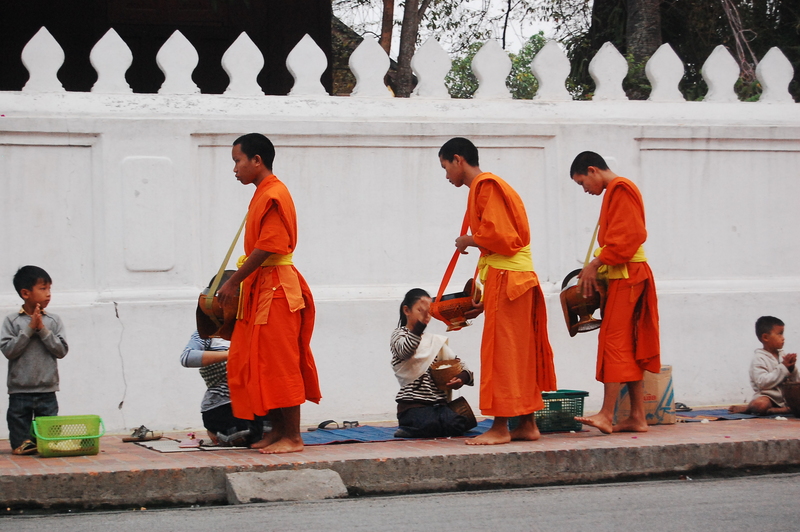 I also was able to witness the monks collecting alms for the first time, a morning ritual where the 308 monks who live in Luang Prabang process down the street each morning at 5:30 a.m. collecting donations of sticky rice from all of the locals. It is a beautiful and meditative sight, although tainted by the number of tourists wanting to get involved, still manages to give a moment for pause. As we wrapped up our time in Laos both Therese and I were sad to leave. We were headed for Vietnam to meet up with some friends and though excited for the next adventure, were reluctant to leave the peaceful, picturesque country. Vang Vieng, a small town deep in the heart of Laos, has a reputation. Much like Koh Phangan and the full moon parties in Thailand, Vang Vieng is known for its party culture, but it wasn’t always this way. 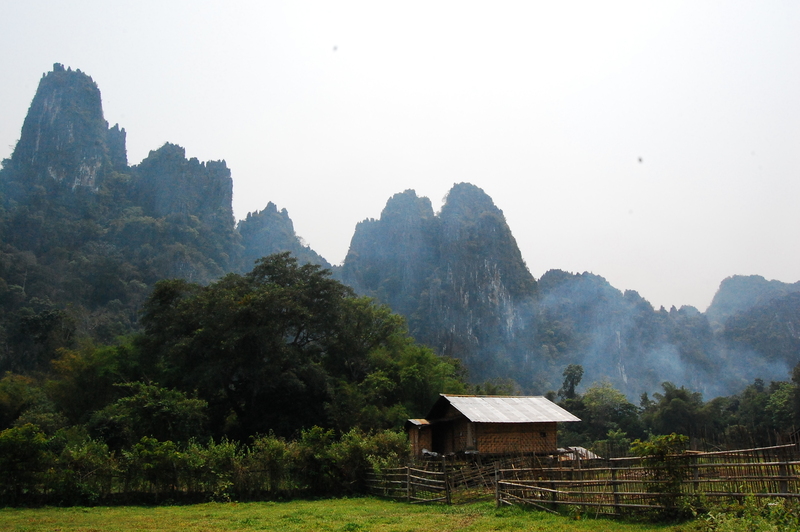 The natural beauty of Vang Vieng. Years ago Vang Vieng was a destination because of its natural landscape: majestic limestone cliffs, pristine lagoons and winding caves. 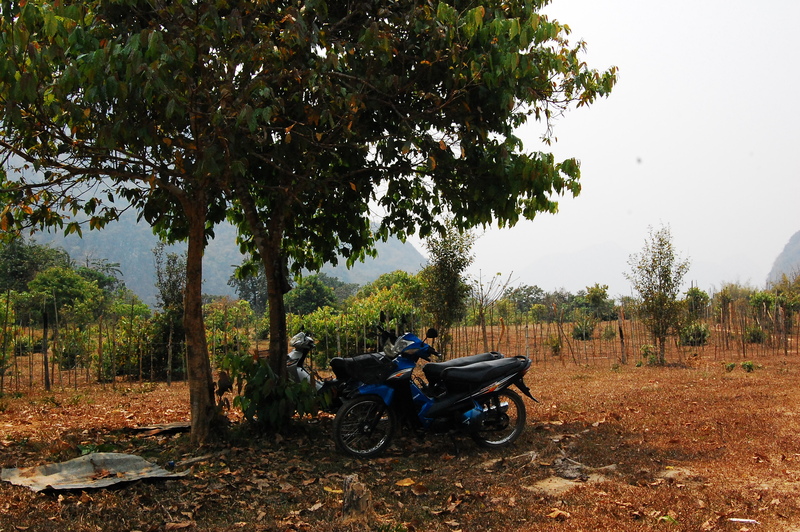 The scenery drew backpackers along the bumpy roads from Luang Prabang to the North and Vientiane to the South. Today the main attraction is the carefree, and often dangerous, activity of tubing. 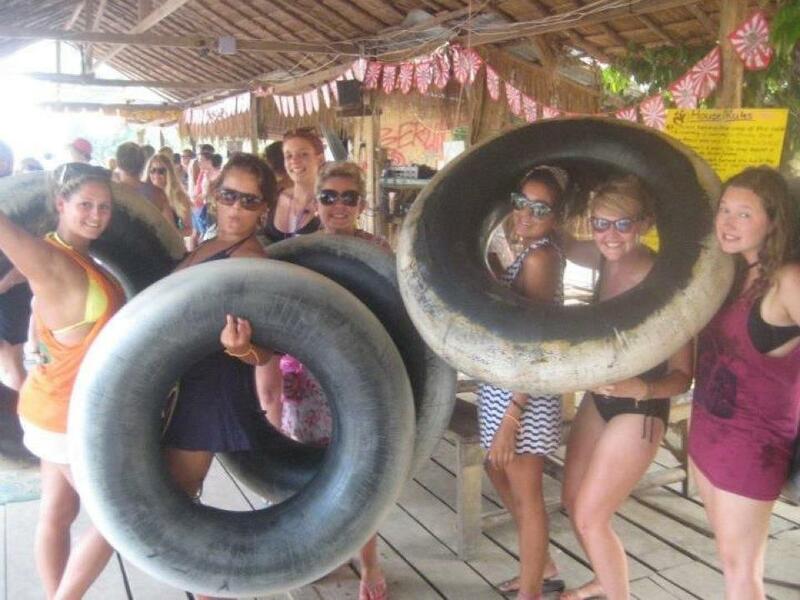 Locals have created a co-op that rents out tractor tire inner-tubes to tourists which they use to create a lazy river experience floating along the Nam Song. 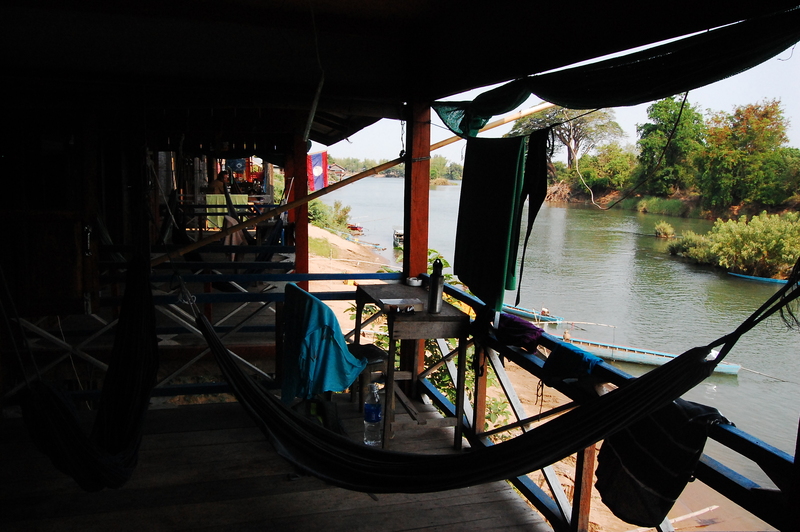 It sounds innocent enough until you realize the river is lined on either side with ramshackle bamboo bars, hooking passing patrons on fishing lines and drawing them into the chaos. Tubing is largely excess, excess for 18 year-olds from Europe or Australia on a gap year to find themselves through travel. With our British pals, trying our hand at the tubing experience. Still, Therese and I were curious and Vang Vieng was the logical stop on our journey north to Luang Prabang so we decided to experience the chaos for ourselves.We had done our research and spoken to a number of friends and fellow travelers who had been. We knew the beauty of Vang Vieng still existed only minutes away from the main stretch of river and we wanted to go caving and hike the limestone mountains. We also thought we would try tubing, for one afternoon. We arrived and quickly found a beautiful room in a bungalow-style guesthouse. The accommodation was just south of the the main drag, far enough away from the noise but still walking distance to the post office and restaurants. 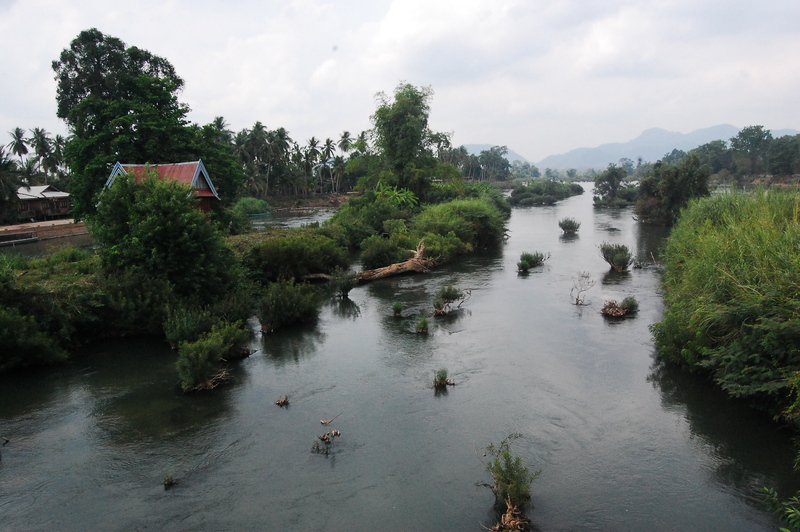 It overlooked the Nam Song river with the mountains reaching serenely toward the sky.We had met a group of girls from England who had become fast friends so we made a plan to rendezvous at 2 o’clock to rent tubes and check out the river. 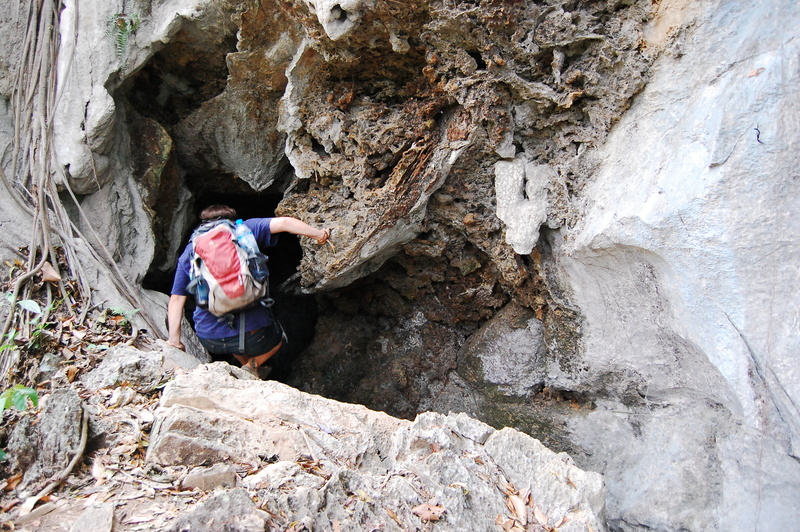 Therese crawls into a cave. Now, after being there, and doing that, I can say the rumours are true. 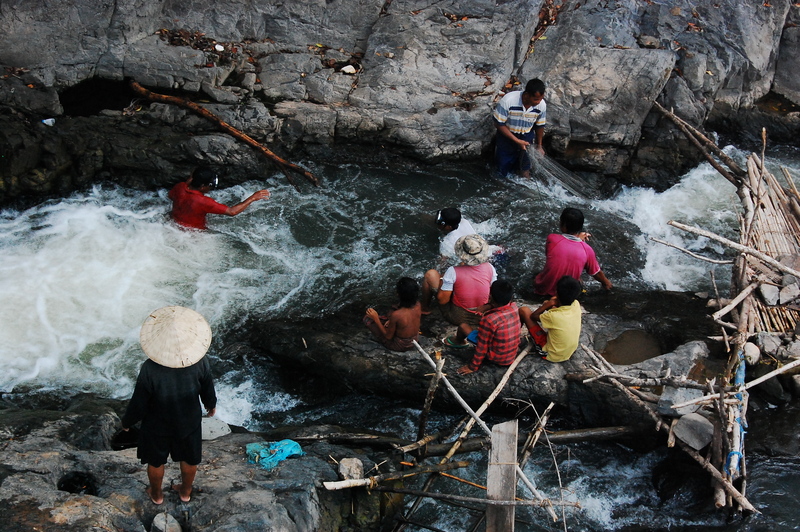 Tubing in Vang Vieng is often appalling, but only for those who make it so. 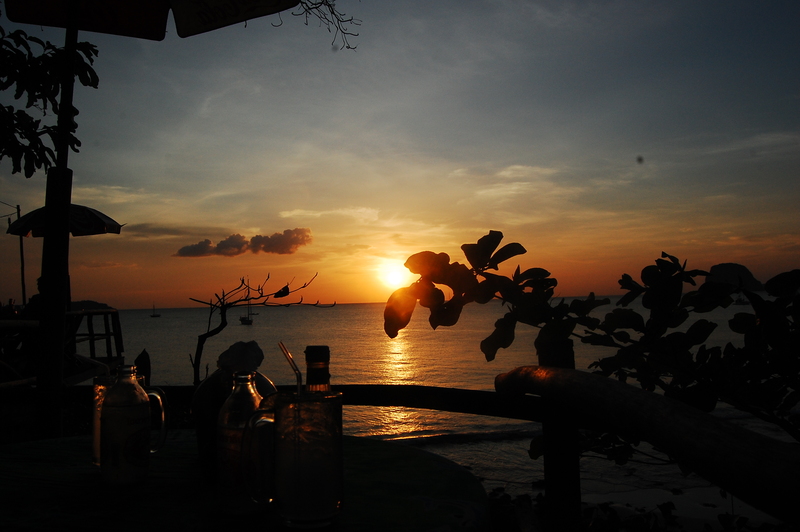 Like visiting any bar or club there are always people who don’t know their limits and behave badly, but there are also those who are there to sing along to the songs, play some games and have some decent conversation. Therese and I swam in the river, floated down stream and played beach volleyball with some new found friends. The majority of the crowds are under the age of 20, unsure of what they want or who they want to be. I stood on the dock of one of the riverside bars with our friend Benoit from Switzerland who was on a 3 week vacation from his job as a computer engineer, and we discussed how we felt old. Still we joked around and laughed and had a lot of fun in the sunshine that afternoon. Our motorbikes – trying to keep the black leather seats in the shade! 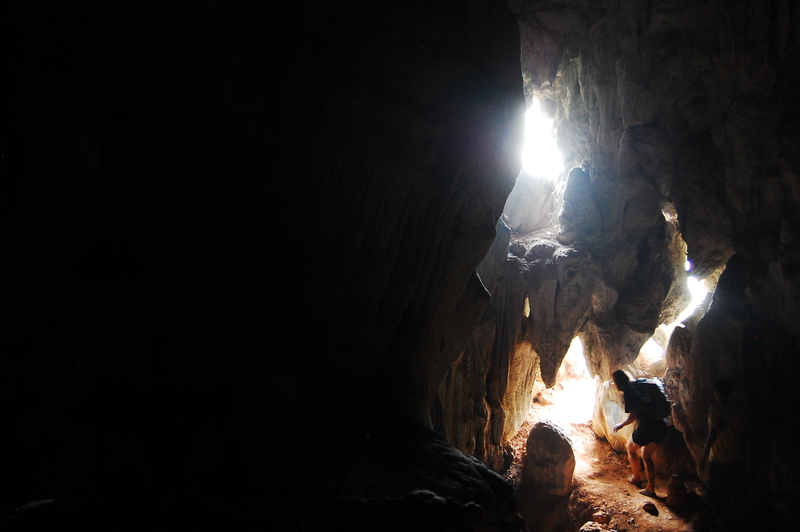 After a delicious dinner of local Laos fare (a rarity believe it or not in this Westernized town) we made a plan, Therese, Benoit and I, to meet at 9 a.m. for breakfast and to spend the day caving. This was one of the highlights of the entire trip. 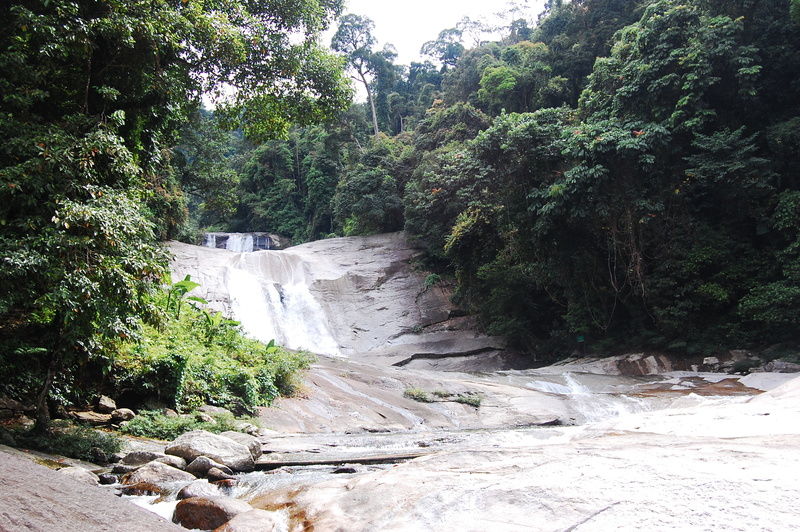 Beyond the fun of learning to drive a manual motorbike (albeit garnering a few bruises in the process) we spent hours in the cool air of the mountains squeezing between rocks and swimming in fresh water pools deep within the heart of the caves. It was both beautiful and scary, often coming face to face with massive spiders or hoping the battery on your headlamp wouldn’t die. 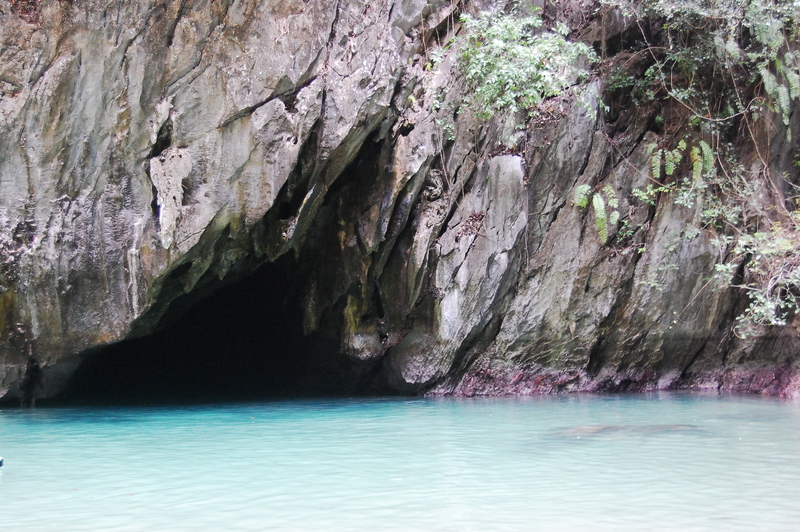 Inside a cave in the limestone mountains. We also rode to a local lagoon with sapphire blue water and locals jumping from tree tops into the pools below. These are the things that put Vang Vieng on the map, and it’s what makes stopping in the new-found party town worth it. After an adventure of a bus ride (12 hours, sharing our single bed bunk bed!) 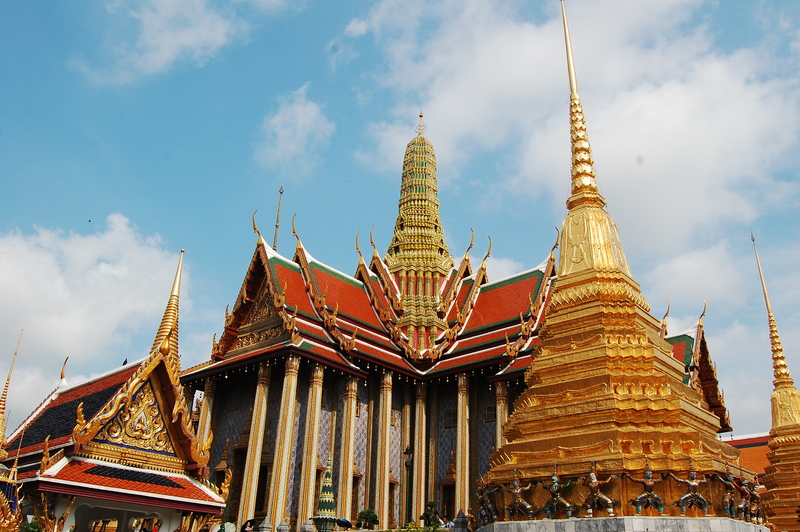 Therese and I arrived in Vientiane – the capital of Laos. 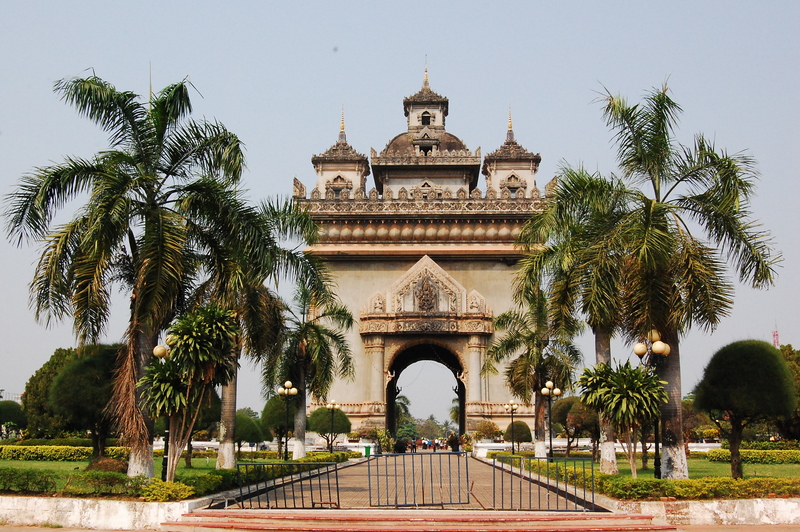 Vientiane exemplifies the French influence in Laos. 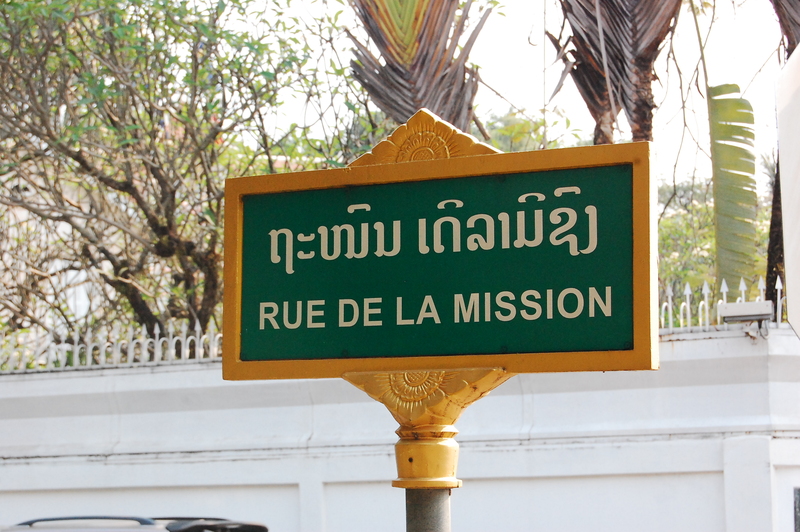 This city is characterized by the fusion between french and Laos culture. Street signs are mostly posted in french, bakeries line the street and vendors sell baguettes on the side of the road. But there is a saying in Asia: same same, but different. Vientiane has an Arc de Triomphe, it has the french cuisine and the white washed buildings we associate with Nice, but it is certainly different. The baguettes, for example, are made with coconut milk and rice flour. Sure, they look the same, but boy, do they taste different. Laos 1960’s version of the Arc de Triomphe. 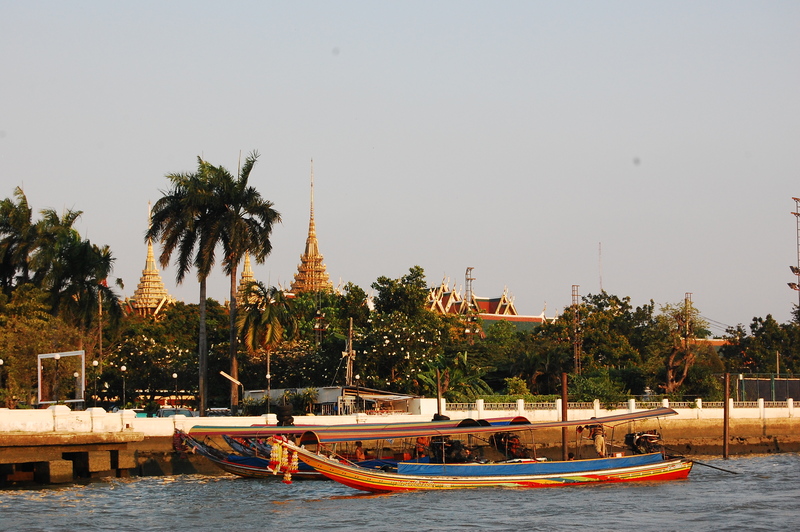 We only spent one night in Vientiane, but had two full days – plenty of time to walk around the entire city. 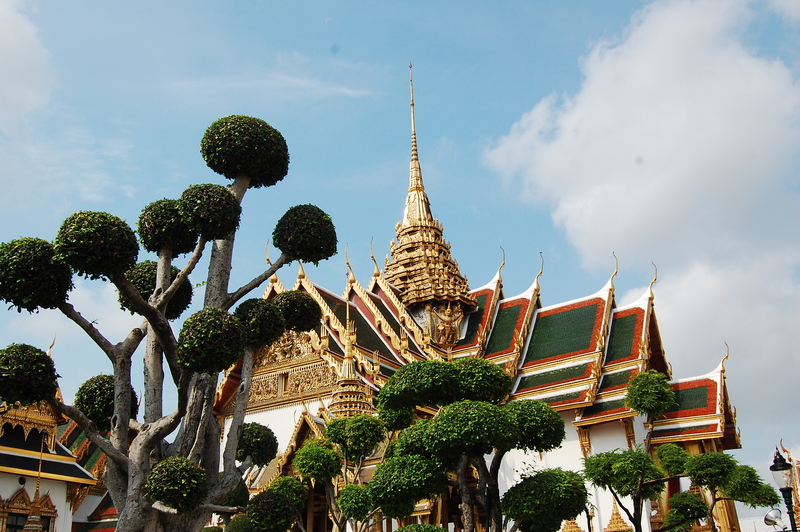 Despite the outrageous heat (40C) we spent the day exploring, visiting a local shrine and temple, mailing postcards and seeing some of the sights. We even happened upon the filming of a music video, rows of women dressed in traditional wrap skirts in beautiful silks and men in linen shirts dancing in rows, almost bollywood-esque to playback blaring over a PA system.It’s moments like this that I am grateful for – the unexpected that comes only with little planning and an open mind. 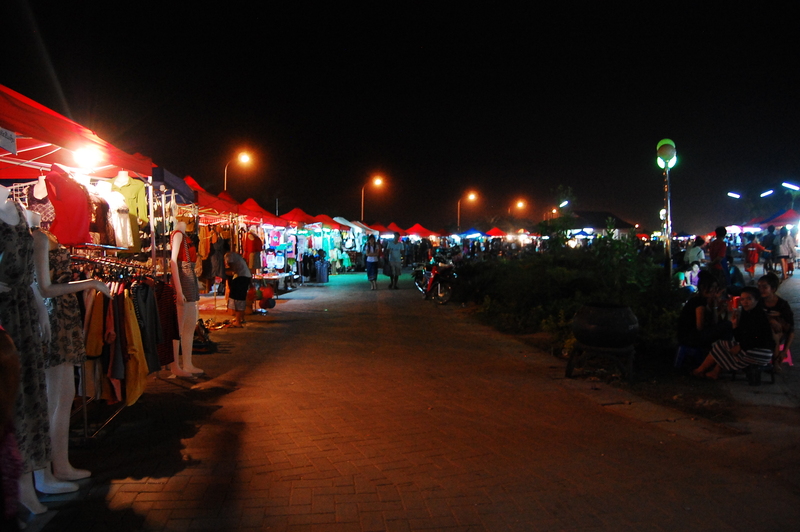 As the sun set we stumbled upon a night market on the city’s waterfront, well, what is a waterfront during rainy season. During dry season (which we were in) it is more or less like a massive desert riverbed. We spent a lot of time wandering up and down the rows of wares at the night market, stopping for smoothies and banana crepes (my new favourite snack) and purchasing some local crafts to take home. When we had gotten our fill we headed back to our questionable room, had cold showers and managed to get some sleep before the winding uphill journey to Vang Vieng the next day.